More than three years before the Men’s EHF EURO 2020, the first to be staged with 24 teams and hosted in three countries, the championship’s official logo was unveiled in Vienna on Monday. With the presentation of the new EHF EURO logo, the European Handball Federation enters a new era in the continuous development of its flagship national team event. The logo design template developed by Infront Sports & Media, the EHF's media and marketing partner for the EHF EURO events, will be given to all future EHF EURO hosts, men and women, to ensure a coherent look that is clearly related to the EHF, with the strength of the EHF brand reflecting positively on the competition. The launch of the logo coincides with the start of the first qualification matches en route to the EHF EURO 2020. Nine teams – Greece, Cyprus, Faroe Islands, Turkey, Estonia, Kosovo, Italy, Luxembourg and Georgia, seeded in three groups of three teams each – play in the first qualification phase from November 2016 to January 2017. The three group winners qualify for the main qualification phase. “With the beginning of the first qualification phase, the road to the EHF EURO 2020 in Sweden, Austria and Norway starts in earnest. We are very happy that we are already able to present the championship logo and we hope that it will quickly develop into a true trademark for the EHF EURO 2020,” said former Swedish international Stefan Lövgren, Managing Director of the Swedish Organising Committee for the EHF EURO 2020. Sweden will organise two preliminary and one main round group plus the final weekend at the EHF EURO 2020. Venues chosen are Gothenburg’s Scandinavium, the Malmö Arena and the Tele 2 Arena in Stockholm (final weekend only), a 20,000+ capacity stadium. Austria will host two preliminary round groups and one main round group in the Vienna Stadthalle and the Graz Messe Arena. The new Trondheim Arena, which is currently under construction and will seat 8,000 people, is the venue for the two preliminary round groups played in Norway. Martin Hausleitner, Secretary General of the Austrian Handball Federation, said: “The aim was to create a logo that is recognised beyond just the actual championship and we definitely managed to do this. "The colours of the hosting nations, in this case Sweden, Austria and Norway, are incorporated into the logo itself. That way a logo was created that will stay in people's minds not just before and during the EHF EURO, and which will not lose any of its recognition value over the years to come and for future EHF EURO events. “The EHF EURO 2020 is a milestone in the future development of European handball, with 24 teams participating for the first time, in addition to three host nations and a new logo." 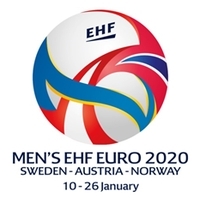 The Men’s EHF EURO 2020 will be played from 10 to 26 January 2020. The three hosts as well as the EHF EURO 2018 champions will qualify directly. The draw for the main qualification phase is expected to take place in April 2018. 32 teams will take place in this qualification, vying for 20 remaining spots at the final tournament.